GSX Server allows you to allocate a portion of the GSX Server host memory to each virtual machine. By adjusting this setting, you can affect the virtual machine's performance. You set the size of an individual virtual machine's memory in the virtual machine settings editor or the VMware Management Interface. The minimum size of the memory for the virtual machine should be set based on the recommendations of the operating system provider. 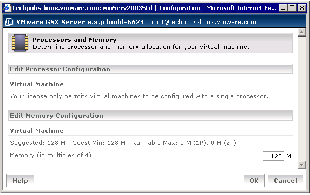 When you create a new virtual machine, the wizard sets what VMware believes are reasonable defaults for the memory size of a virtual machine, based on the type of the guest operating system and the amount of memory in the host computer. What kinds of applications will run in the virtual machine. What other virtual machines will contend with this virtual machine for memory resources. What applications will run on the host at the same time as the virtual machine. The total amount of host memory that all running virtual machines can use; for more information, see Specifying How Much RAM is Used by All Running Virtual Machines. The file system where the virtual machine is stored. You cannot allocate more than 2000MB of memory to a virtual machine if it is stored on a file system that cannot support files larger than 2GB, such as FAT16. You will not be able to power on such a virtual machine. Further, you cannot allocate more than 2000MB of memory to a virtual machine if it is stored on a FAT32 file system, even though it does support files up to 4GB in size. For more information on host memory use, see Understanding Memory Usage. To set the size of an individual virtual machine's memory from the VMware Virtual Machine Console, complete the following steps. 1. Connect to the virtual machine with a console. 2. Open the virtual machine settings editor (VM > Settings). The virtual machine settings editor opens with the Memory tab selected. 3. 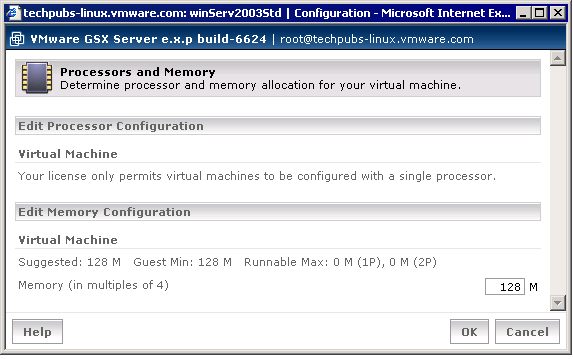 Allocate memory to the virtual machine. Use the slider or spin controller, or type the amount of memory to allocate in the MB field. The value must be a multiple of four. Note: The minimum size of the memory for the virtual machine should be set based on the recommendations of the operating system provider. To set the size of an individual virtual machine's memory from the VMware Management Interface, complete the following steps. 1. Connect to the virtual machine with the management interface. 2. On the Status Monitor page, choose Configure Hardware, then click Edit next to Processors and Memory. 3. 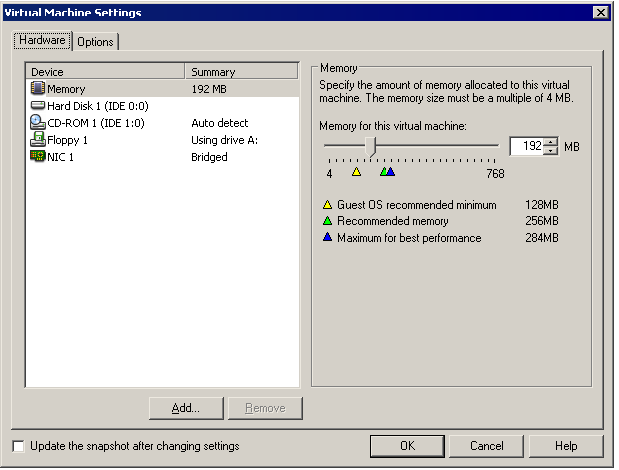 Type the amount of memory to allocate to the virtual machine. The value must be a multiple of four.